Why did you detail such a new car? For most that don't know the 2016 Focus RS is built in Saarlouis, Germany. My RS was built on 09/22/16, and I didn't receive it until 11/22/16. It sat at the port for almost a month, and the boat ride took almost a month. By the time I picked up my RS it was filthy. Anyone thinking a regular washing would do the job is sadly mistaken. The amount of deposits that were removed by my detailer was ridiculous! He thanked me many times for bringing him my RS without doing anything but pulling the protective factory film off. Paint Protection Film (PPF), aka clear bra, has been on the market for quite some time now. You used to only see it on high-end cars like Ferraris to protect the front from rock damage. I've used 3M VentureShield and XPEL Ultimate on past vehicles, but my detailer chose Suntek PPF C for my RS. As the technology gets older the films get better. No longer do they yellow due to UV rays. 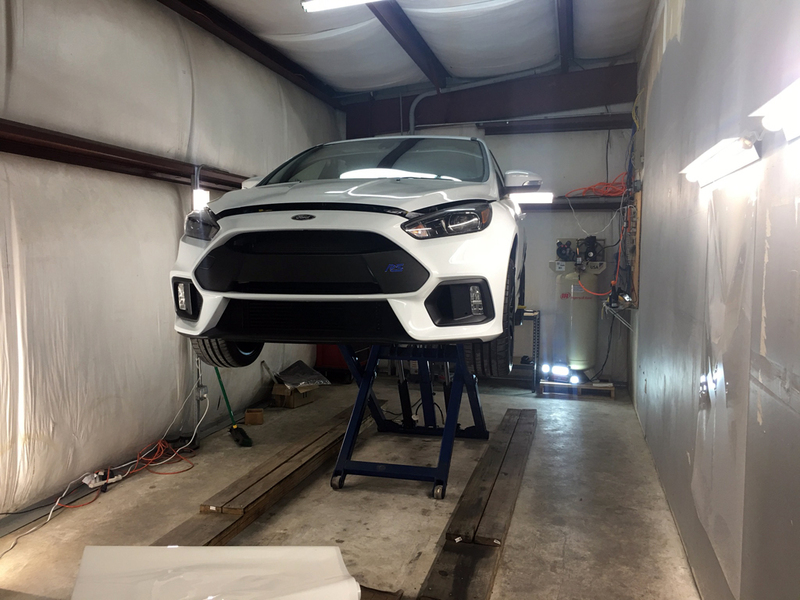 You can coat an entire vehicle with it, but I chose to coat the entire front of my RS along with the side skirts and rear splash guards (track package). This will limit the amount of road rash or track debris that gets kicked up to take chunks of the factory paint out. 1. Hi Performance Detail in Baton Rouge, LA completed the work. 2. Suntek PPF C - Dealer Track package = Entire hood, bumper, front fenders, mirrors, a-pillars, roof strip, side skirts, splash guards. 3. Nanolex Si3D HD coating was applied to the entire RS after the Suntek PPF C was applied (body, over the PPF, glass, wheels & brake calipers). 4. I apologize for only 1 picture after the detailing & PPF steps were completed. My detailer is a very busy guy, and a Focus RS isn't high on his priority list to take pictures of! 1. To prevent any rock damage from the 275/35/18 Hoosier A7 tires, I had all (4) doors coated with the same Suntek PPF C. Then Nanolex Si3D HD coating was applied.